eBay Store Categories Phones by Carrier Verizon Wireless Sprint Cellular South Alltel Wireless Nextel AT&T T-Mobile GSM Unlocked Phones by Brand Blackberry Casio HTC LG Motorola Palm Samsung Other Brands Internet Devices Tablets Netbooks USB Modems Mobile Hotspots PC & Express Cards Accessories Batteries Chargers Headsets Memory Cards Skins & Cases USB Cables Bid Allies Newsletter Add us to your Favorites and receive emails about new items and promotions! 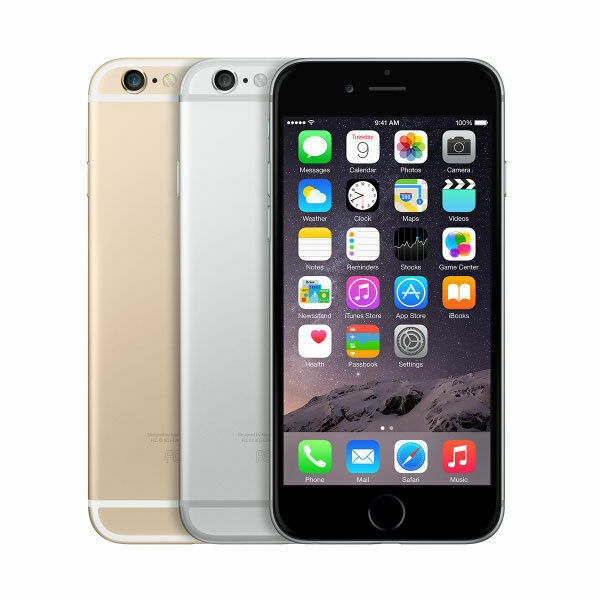 Sign Up Factory Unlocked Apple iPhone 6 64GB Smartphone Condition Cosmetics Functionality Contract Item has been reconditioned by qualified technicians and comes with accessories in generic box. This is a B stock item, meaning unit is in fair cosmetic condition and will show signs of use in the form of scrapes or scratches. Item has been professionally tested and inspected according to R2 standard. Our tests show that all features work properly. R2 ready for reuse. No contract is required. This phone is ready to be used with an existing service or a new one. Activation Status This phone is factory unlocked. That means it will work with a valid SIM card from any GSM Network worldwide. This is not a CDMA phone, so it will not work for carriers such as Sprint and Boost Mobile. Package Contents Factory Unlocked Apple iPhone 6 64GBAC Wall Charger. SIM Not Included Lithium Ion Battery. USB Sync Data Cable Service Provider : GSM: Any GSM Network worldwide i.e. T-Mobile, AT&T, Simple Mobile, Rogers, Fido ....Model : Apple iPhone 6.Features : iPhone 6 isn't just bigger, it's better in every way. A 4.7-inch Retina HD display. An A8 chip with 64-bit desktop-class architecture. A new 8MP iSight camera with Focus Pixels. The Touch ID fingerprint identity sensor. Faster LTE and Wi-Fi. Longer battery life. And iOS and iCloud. All in a 6.9mm thin seamless design.Operating System: iOS.Processor: Apple A8 64-bit.Capacity: 64GB.RAM: 1 GB.Wireless Band: GSM/EDGE; UMTS/HSPA+; DC-HSDPA; CDMA EV-DO Rev. A and Rev. B (CDMA models only); Activate Advanced Calling 1.0 to experience Simultaneous Voice & Data.Dimensions: 5.44" x 2.64" x 0.27".Weight: 4.55 oz.SIM Type: Nano.Display Resolution: 1334 x 750 pixels.Display Type: LED-backlit widescreen Multi-Touch display with IPS technology.Display Size: 4.7".Battery Type: mAh Lithium-ion Non-Removable.Battery Standby: 240 hours max. (10 days).Camera Front: 1.2 megapixel, f/2.2 lens, BSI sensor, 720p video.Camera Back: 8+ megapixel phase detection auto-focus, f/2.2 lens, warm LED flash, BSI sensor with 1.5 ultrapixels / touch focus, face detection, panorama, burst mode, auto HDR.Video Resolution: 1080p HD can capture stills while recording video, 240 fps slow motion mode, time lapse video, stabilization.Audio: Real-Music Ringers, Headphone Jack, HD Voice.WiFi: 802.11 a,ac,b,g,n.GPS: A-GPS.Bluetooth: HFP 1.6, PBA, A2DP 1.2, AVRC 1.4, HID, PAN, MAP.Earjack: 3.5mm. We accept Credit Card, Debit Card and eCheck payments through PayPal only. Buyers are required to arrange a payment within 72 hrs of auction closing. eCheck payments take 3 to 5 business days to clear through PayPal. Our auction payment ID will be provided in payment notification email. Sales Tax: 6.625% will be collected when "Shipped To" address is in NJ. United States We ship to all 50 US states. Certain areas may incur additional charges. Our shipments are processed within 1 business day of cleared payment. (excluding holidays) We reserve the right to use a different shipping carrier when more convenient. Shipping & Handling cost : US Postal Service Parcel Post : Free. Delivery within 3 to 9 business days. US Postal Service Priority Mail : US $7.25. Takes from 2 to 5 business days. UPS 2nd Day Air : US $21.95. Guaranteed by the end of 2nd business day. Return Policy We back our products with a 30-DAY SATISFACTION GUARANTEE! Customers must inspect item(s) and notify us within 30 days of any problems. If you have a problem with your item, please contact us before leaving feedback. All items being returned must be issued an RMA number BEFORE they are returned. Warranty No manufacturer's warranty should be expected, unless stated in description. Extended warranties are provided through third party partners. Frequently Asked Questions About Bid Allies Click on the FAQs button to view our most commonly asked questions that we've recieved about our items, payment, shipping, warranty, return policy and more. If you still have questions after reading the FAQs, feel free to contact us by clicking the green button in the section below. Customer satisfaction is our top priority. Please give us a chance to resolve any issues before posting a feedback. Please contact us with any questions or concerns. Business hours of operation: Monday - Friday : 9:00AM - 6:00PM Eastern Standard Time. Saturday, Sunday and all major USA holidays : Closed. Questions?... Need help? All inquiries are responded to within one business day. Listing designed by BidAllies Web Team © 2017 All Rights Reserved Questions?... Need help? Business Hours Mon - Fri: 9AM - 6PM EST Sat - Sun: Closed All inquiries are responded to within one business day.